A look at the ethical dilemmas facing the medical doctor in modern China today. April Kim compares western and eastern views on euthanasia as well as historical aspects and concludes with a hard ethical decision in a case scenario. This translation article discusses disorders of the Spleen and Stomach using Chinese herbal medicine. Written by a leading Spleen and Stomach doctor, Prof Shi, now 84 years old, it has been for the first time translated into English by April Kim. April Kim interviews Dr Zhiyun Bo in Beijing, China. Dr Bo is the inventor of abdominal acupuncture. This new form of acupuncture is used to treat serious, chronic conditions, such as those seen after a stroke. 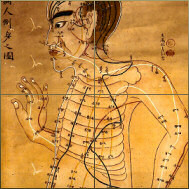 This in-depth article explores Chinese medicine's meridian system. Acupuncture points are located along the Jinglou. When these points are stimulated using a needle, electrical reactions occur.